The Upper Falls News has been on vacation all summer. Now that summer's over, we're now ready to go back to our regular erratic publishing schedule. Where am I? - Here's a photo of a spot in Upper Falls without its surrounding context. The game is to look at the photo and identify where in Upper Falls this poor guy is (answer below). Where am I? - Extra bonus - Try to figure out where in Upper Falls this is ... and what kind of animal is on the grass. Click on the photo for a better look (answer below). Sign up for the "Tour de Newton" - The first annual Tour de Newton is scheduled for October 6 and it promises to be a great event for everyone - kids, adults, experienced bicyclists and casual riders. The Tour will be a 20 mile bicycle ride that will start simultaneously in all 13 villages at 9:30AM. Here in Upper Falls, we'll be starting/ending at The Depot (Chestnut and Oak streets). You'll be riding the whole loop with a group of your Upper Falls neighbors and be guided by a leader and a sweeper who know the route. The route's been carefully chosen to be a fun, safe and pleasant ride. As the group arrives at each village, you'll be met by greeters who'll give you a specially designed village badge and tell you a bit about the highlights of their village. Complete the whole route and you'll be entered in a drawing to win a new bike from International Bicycle on Needham St. It should be a great event, so sign up here. Upper Falls Greeter Needed - If you don't want to ride 20 miles on a bike, how about volunteering to be one of the Upper Falls greeters. Your job will be to meet each of the incoming groups of riders, hand out the Upper Falls badges and water, tell them a bit about Upper Falls, and generally be an ambassador for the village. Mary Durr has already signed up as a greeter but we could use a few more. Drop us an email if you'd consider taking on that job for a few hours on Oct 6. Fine Feast of the Falls Fotos - Evan Westrate posted a great series of 40 photos from June's Feast of the Falls in Hemlock Gorge. Check them out here. Upper Falls Greenway Has Green Light - All systems are go for construction to begin on the Upper Falls Greenway in mid October. The Greenway will transform the abandoned railroad line behind Needham St into a new mile long park for walking, bicycling, and jogging. The necessary permitting is taken care of, the city has submitted the request for the 99 year lease to the MBTA, and the project is set to go. Upper Falls Celebrity - Many of you probably already know that baseball great Ted Williams once lived in Upper Falls. Reader Larry Smith just sent information about another Upper Falls baseball player. "Shano" Collins (1885 - 1955) lived most of his life in Upper Falls. He played for the Chicago White Sox, and the Red Sox and then went on to manage the Red Sox. When he retired from baseball he opened Collins Bar & Grill on Needham St on the site that later became Skip Jacks Restaurant. Here's a bit more info. Crash Landing in Hemlock Gorge - Reader Dave Downs sent this story from his teenage years that happened right where the Feast of The Falls dinner table was set up last June: While I was in High School I drove a Vespa Scooter. My friend and I drove down on the aqueduct on the Needham side towards Echo Bridge. I was going around 30 miles an hour following the warn dirt path when the Vespa's muffle hit a surveyor's granite marker! The scooter stopped dead. I went flying over the handle bars with my friend, who was sitting in back of me. I landed like an airplane on my belly with my friend riding on top of me. We skidded to a stop on the grass just as a plane would coming in for a landing! Neither of us was hurt but I had to buy a new muffler - how lucky and foolish teenagers are! Village Day Is Around the Corner - Upper Falls annual Village Day will be held on Sunday afternoon from 2 -5 PM, Sept 29 at the Emerson playground. There'll be food, fun, entertainment and all your neighbors, so plan to be there. Village Day is brought to you by the Upper Falls Area Council and the Upper Falls CDC. Fun on the Mountaintop - Our high living neighbors have done it again. The folks up on Cottage St and Columbia Ave, the highest point in Upper Falls, held the 2nd annual Upper Upper Falls Block Party last weekend. There was lots of great food and drink, music by a DJ, bouncy castle for the kids, and the Patriots game on a curbside TV. A fine time was had by all. Though I'm an Upper Falls lowlander I did manage to score an invitation. The only problem was that my Sherpa called in sick that day and I had to get myself up the hill. I'm still recovering from the altitude sickness but it was worth it. Area Council Meets This Week - The Upper Falls Area Council will be meeting this Thursday, Sept 19 at 7 PM at the Emerson Community Center. The public is welcome. 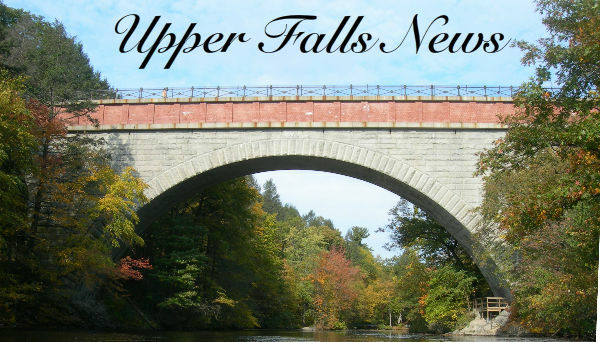 Items on this month's agenda include Upper Falls Village Day plans, Elliot St development project, future candidates night, and (I presume) a resolution to wish the Upper Falls News editor a happy birthday. The public is also specially invited to contribute to the village Pedestrian Plan. If you have any ideas for improving sidewalks, crossings, pathways, etc in the village, please come with your ideas. In particular, any suggestions to help seniors especially welcome. Did You Know ... Only one person in two billion will live to be 116 or older. "Did you know ..." features an interesting and random fact every issue, collected by ten-year-old Upper Falls resident Jayla Reilly. 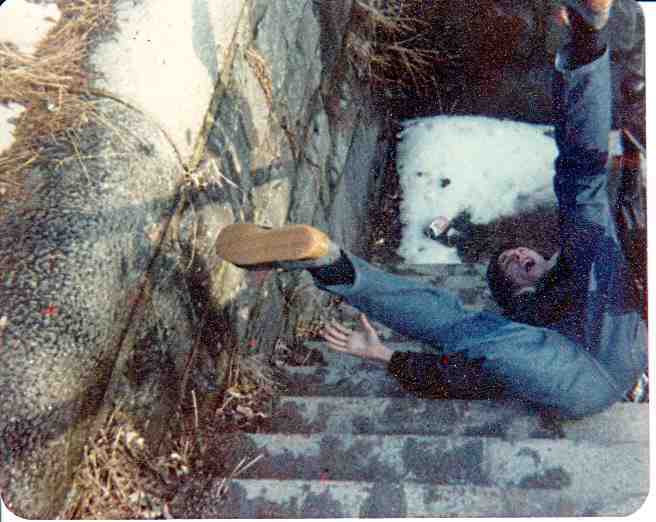 'Where Am I" Answer - This is a photo from 1972 of Scott Wilson, a former West Newton resident appearing to tumble down the stairs on Echo Bridge to Ellis Street. One year, Scott and his Newton teenage buddies went through a phase of setting up and photographing staged photos around town. No teenagers were hurt in the creation of this photo. Where Am I - extra bonus answer - That's a muskrat on the field halfway up Ellis Street in Hemlock Gorge. Carol Stapleton nearly gave her life (OK maybe just the back bumper of her car) to get that photo. She spotted it while driving up Ellis St and stopped to snap the photo, much to the chagrin of the driver barreling up behind her. Carol says that there's a pair of muskrats that appear to live nearby and she's seen them a few times recently.